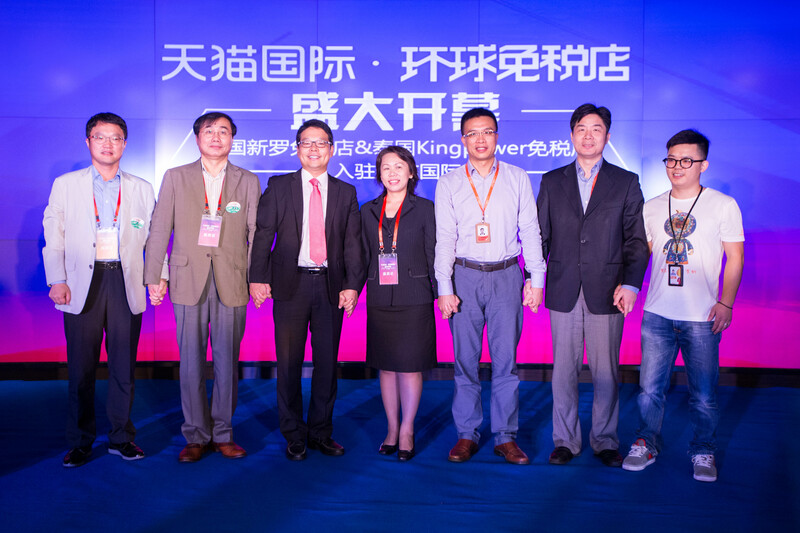 Hangzhou, China, July 28, 2015 – Tmall Global, an overseas platform and an extension of Alibaba Group's B2C Tmall.com business in China, today announced partnerships with one of South Korea's top duty-free chains, The Shilla Duty Free, and Thailand's leading duty-free chain, King Power, to enhance the duty-free shopping experience for Chinese travelers to these two countries. The newly-launched innovative "World Duty Free service" is the first of its kind in China and aims to offer consumers and travelers a seamless solution for purchase and pickup of duty-free goods. The partnership allows Chinese consumers to enjoy more savings and increased convenience by pre-purchasing products and discount vouchers on Tmall Global before they travel, and then collect their purchases or use their discount vouchers at the duty-free stores in South Korea and Thailand through their Alipay receipt or barcode from their mobile phones. The World Duty Free service also allows merchants to target specific consumer groups from China and thereby discover trends and demands of hundreds of millions of Chinese shoppers across Alibaba Group's China retail marketplaces. Alvin Liu, general manager of Tmall Global said, "The World Duty Free service is an important strategic initiative of Alibaba Group's globalization strategy. This project connects Tmall Global, Alipay and various major duty-free retail groups from around the world to create an integrated e-commerce model offering a seamless cross-border shopping experience for Chinese travelers." "We want to make the duty-free shopping experience as simple and easy as possible for our customers. The new service will save them time in exchanging foreign currency, queuing, product wrapping and tax refunds. In the future, Tmall Global aims to bring more duty-free shops onboard to broaden coverage to other popular destinations around the world." According to the Ministry of Commerce of China, in 2014, over 100 million Chinese people traveled abroad and spent more than RMB one trillion overseas, with Korea, Japan and Thailand among the most popular destinations. Following Alibaba Group's cooperation with the South Korean government earlier this year, Tmall Global is the first and only e-commerce platform in China to partner with a Korean duty-free store chain. The cooperation with two major duty-free chains from Korea and Thailand is supported by governments of those countries in order to ensure the back end integration of cross-border trade is well-implemented, and thus provide Chinese travelers the best consumer shopping experience possible. To commemorate the launch of this new service, The Shilla Duty Free is offering a promotion of up to a 50 percent discount on selected items. King Power is also offering a free RMB 500 coupon for purchases above RMB 500. Tmall Global is in discussion with dozens of duty-free companies in other countries to offer this service for Chinese travelers traveling to other destinations. Tmall Global also plans to work with other Alibaba Group businesses such as Alipay and Alitrip to provide an integrated and comprehensive travel and shopping experience to Chinese consumers. Around 5,400 overseas brands from 25 countries and regions have opened stores on Tmall Global, which is used by a growing number of brands from the U.S., Germany, Australia, South Korea, Japan, Taiwan and Hong Kong as a stepping stone into China.